Part of GitHub’s blazing speed comes from a trusted environment and while I’m sure they’ll be white-listing paginate-v2 in the short term I’m not sure if the Algolia indexer is on the cards. There are always plenty of options in the cloud so I looked for a build server. 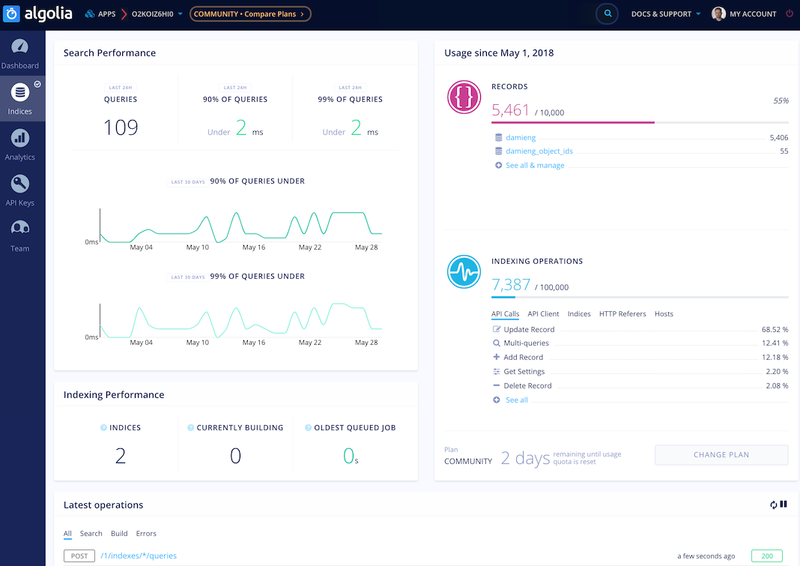 I’ve used AppVeyor, CodeShip and Travis CI before but decided to this time go with CircleCI as I wanted to try their new faster v2 docker-based infrastructure and take advantage of their free tier. Given I’m going to use CloudFront for my CDN and that GitHub pages won’t work for this job I went with S3. I know it well, the command line tools are great, it’s cheap, fast and integrates well with CloudFront. S3 did however bring a few problems with it’s own - primarily because the links on my blog had no file suffixes - I didn’t want either .php or .html and WordPress makes this a breeze. A complete version of my circle config is available. Adding the CloudFront CDN is pretty easy and well covered elsewhere. I’ll just point out that you must paste in the origin domain name from S3 and not choose the S3 bucket in the drop down. The latter ties CloudFront to the storage directly and ignores MIME types, redirects etc. By pasting the origin name in you’re taking advantage of the S3 WebSite features that make redirects etc. possible. Also, while testing, you might want to specify a low TTL of say 120 (2 minutes) until things are fully stable. I do enjoy discussion and debate whether designing software or writing articles. Many times the comments have explored the subject further or offered corrections or additional insights and tips. For me, they are vital on my blog so I was somewhat disappointed that Jekyll provides nothing out of the box to handle them. Third-party solutions like Disqus exist that require you either pay a subscription or have ads inlined with the comments. That $9/month adds up and the alternative of injecting ads onto my blog just to support comment infrastructure doesn’t sit right with me. So what does Jekyll have that we could build upon? Well, one very useful feature is the ability to process ‘site data’ held in YML files as a kind of data source for generating content via the Liquid templating language. message: "This is a great solution for 'dynamic' comments on a static blog!" Then we have a model where we can gather all the ones that respond to a post by traversing a single folder and performing some sorting. By using one-file-per-comment we also make deleting, approving and managing comments as easy as possible. I’ve included all three includes you can copy to your Jekyll _includes folder. You’ll also need to add the following line to your Jekyll _config.yml. This is required so my sort function can work due to a couple of restrictions in Jekyll. The next step is getting all the comments out of your existing system. I was using WordPress so created a simple PHP script that will extract them all into individual files with the right metadata and structure. Disqus users should check out Phil Haack’s Disqus exporter! We can now render existing comments but what about accepting new ones? You could easily port this to another C#-capable environment - or port the solution entirely to another language. If you have a lot of comments you could run the function on three platforms and round-robin the DNS to take advantage of the free usage tiers on each. Installation requires a few steps but can then just update whenever you update your fork. You should now be able to post a comment on your blog and see it turn up as a pull request against your repository! 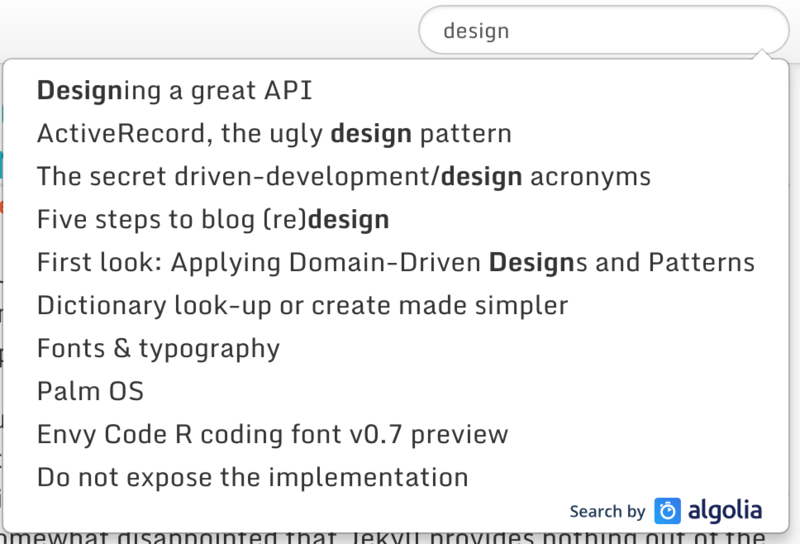 In Part 3 of the series I’ll go into how I implemented my site search with Algolia!